Dotted lines separate pairs being duplicates ("same size" and "same contents" in the present case). 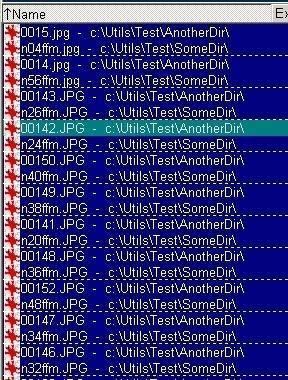 As a rule, the next action is to select files according to a simple regularity, such as "every second", "all but every third", etc. 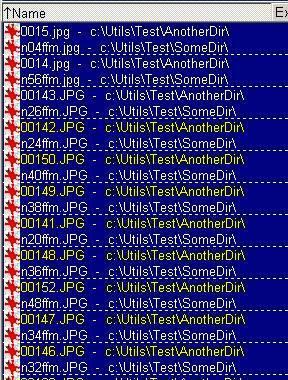 It's easy if the number of files is not too great, otherwise it's a very exhausting job. Distance between files to mark is given by the "Step" edit box. Step is an integer greater than 1 (default 2). "Files to mark" dropdown list contains the following choices: "All" (default), "Current & above", "Current & below". 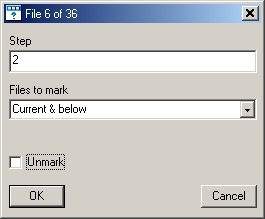 The script also allows to unmark rather than to mark files - to switch this mode on, check "Unmark". So, the multiple execution of script allows to select files according to more complex regularity, despite the number of files to select. The script works also in a usual file panel, but I can hardly imagine the situation when it could be useful.